You can run Drill queries from Postman, a Chrome browser extension and HTTP client for testing web services. 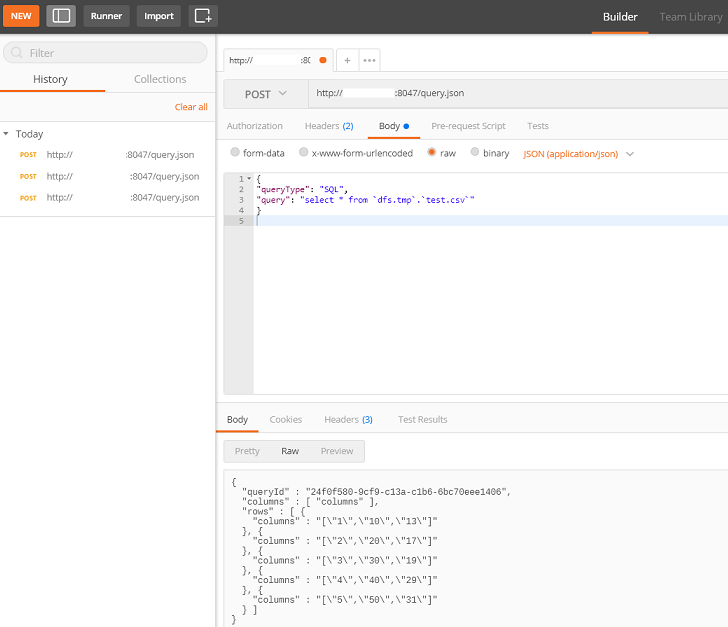 To run Drill queries from Postman, install the Postman extension and then configure Postman to connect to a Drillbit and run queries. 1-To install the Postman Chrome browser extension, go to https://chrome.google.com/webstore/detail/postman/fhbjgbiflinjbdggehcddcbncdddomop?hl=en and then click + ADD TO CHROME. 2-Click to open the application. You can go to chrome://apps/ to find the Postman icon if you do not see it. 3-In a new tab on the Builder page, set the type to POST, and enter the request URL as http://<drillbit-hostname>:8047/query.json. 4-Select the Headers tab and then enter Content-Type as the key and application/json as the value. Add another entry with User-Name as the key and mapr as the value. 5-Select the Body tab and then select the radio button labeled raw. A new drop-down list appears next to the radio buttons. Select JSON from the drop-down list. "query": "select * from `dfs.tmp`.`test.csv`"
7-Click Send to submit the query. The Postman displays the query results.